This store is an up-to-date establishment and Dr. H. B. Judd, proprietor, is an up-to-date jeweler and optician. 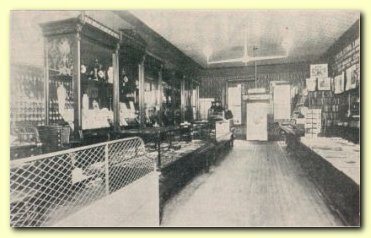 The interior of the store is arranged in a neat and artistic manner and the large stock of goods is displayed artistically. The store has a reputation for honesty and straight dealing and you frequently hear the expression, "Anything you get at Judd's is all right." In the optical line Dr. Judd has had twenty-two years' experience and is an expert in diagnosing vision troubles and prescribing lenses that fit the case. His supply of optical goods and appliances cannot be equaled in any county seat town in the state. The stationery department is well-supplied with the latest books and magazines and special attention is given to high-grade fashionable stationery for ladies.